There I was on top of a glacier, standing on a 15-foot blanket of soft snow covering a quarter mile of hard packed ice--and I took off my jacket. It was a beautiful June day which felt warmer than the actual 60 degrees because sunshine reflected off the unending whiteness. 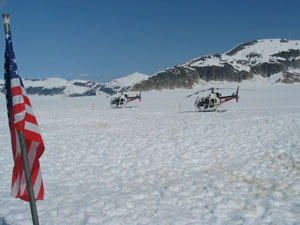 My husband Larry and I had just landed on picturesque Norris glacier from a flightseeing jaunt out of Juneau, Alaska. During the 35-minute helicopter ride, our pilot dipped and hovered through jagged mountain peaks and over blue ice pools to give us incredible views of four kinds of glaciers--retreating, advancing, cascading, and declining. But the terrain wasn’t completely frozen, as we also passed over rainforest trees beside the glistening glaciers. 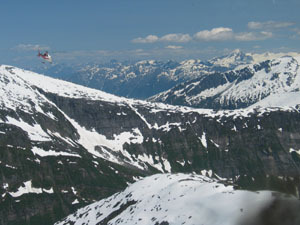 We had chosen this excursion not only for a chance to view Juneau Icefields from the air (which explains why there are no roads into Juneau) but to experience a once-in-a lifetime Alaskan adventure, the opportunity to mush our own dog sled team. As we approached the camp where many sled dogs train for the Iditarod race as well as provide rides to tourists, hundreds of brown and white dots bounced on the surface. 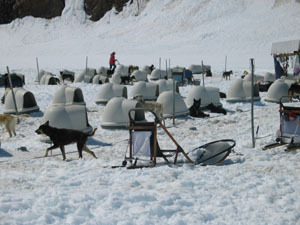 More than 200 individual igloo-style dog houses and a lesser number of tents for humans came into view. We disembarked from the helicopter and tramped through mid-calf-deep snow, glad for the bulky black snow boots issued at the start of our tour. Dogs were everywhere, jumping wildly and barking non-stop. They knew that a run was in the works, and they were raring to go. “Don’t try to pet the dogs,” said John, a professional dog musher who lives on the glacier for months at a time. “They’re in work mode. After the run, they will be relaxed and friendly.” Seeing the dogs, overflowing with adrenalin, tug and strain at their harnesses, we didn’t need a reminder. The dogs are mixed breeds—huskies, greyhounds, malamutes, and pointers--bred for strength and muscle, with endurance, speed, and temperament also desired characteristics. Typical Alaskan huskies are medium build with short hair, in all the usual canine colors. They may look skinny, but that’s because they’re athletic dogs that burn a lot of calories while mushing. Because they are so excitable before a run, we left canine handling to John and got ready for our thrilling adventure.